After the storm passed, in the chilly hour before dawn, the last of the “space zombies” found their way back to their nest in the derelict house. — Frankie Y. Bailey, What the Fly Saw. I am so thrilled to be chatting with the multi-talented Frankie Y. Bailey. I had the pleasure of meeting her at my first ever mystery writers conference, Killer Nashville, several years ago, and also of reviewing What the Fly Saw for Mystery Playground’s Drinks with Reads feature. Frankie blurs genre and writes in every possible tense: her series are set in the past, the almost-present, and the near-future. You can keep up with all she’s doing on her website, FrankieYBailey.com, and also over on the blog she shares with several other mystery writers — including the delightful Vicki Delany — at Type M For Murder. Find her on Twitter @FrankieYBailey. Frankie gives a shout-out to Walter Mosley and two spectacular but often overlooked mystery writers: Pauline Hopkins and Rudolph Fisher. And of course to Eleanor Taylor Bland, the first African-American woman to write police procedurals. Sisters in Crime has a fellowship in her honor for emerging mystery writers of color, so if that’s you or a friend of yours, check it out here. Laura Brennan: My guest today is the multitalented and multifaceted author, Frankie Y. Bailey. Frankie isn’t just a student of crime, she is a PhD — and a professor in the School of Criminal Justice, University at Albany (SUNY). She has won the George N. Dove Award for outstanding contributions to the study of mystery, detective and crime fiction, as well as a Macavity Award for her nonfiction book, African American Mystery Writers. She has not one, but two fiction series: one featuring crime historian Lizzie Stuart, the other a police procedural set in the near-future featuring detective Hannah McCabe. She’s also working on an historical thriller set in 1939. Frankie, thank you for joining me. Frankie Y. Bailey: Thank you so much for having me on, Laura. LB: So my understanding is that you always planned to be Doctor Bailey, but when you first went to college, you were looking at becoming a veterinarian rather than a PhD? FB: Yes. I love animals, and I grew up — I was kind of a shy child, so I grew up playing with my dogs and a hamster and the birds and all of that. And everyone in my family teased me about growing up to become a vet, and it seemed like a great idea. And then I went off to Virginia Tech, and I realized I preferred playing with animals and trying to understand their behavior, that attracted me more than the idea of doing surgery on animals. So I changed my major to psychology and then later added English. But I still love animals. LB: The psychology bit is really interesting because one of the refrains among your fans and reviewers and me is how real your characters are. FB: Oh, it’s really nice of you to say that, and I’m glad you enjoy the characters. Yes, I’m also in criminal justice, that’s my day job, and combining criminal justice and psychology. When I got to Virginia Tech and English was my second major and I did three quarters of Shakespeare, and we spent a lot of time analyzing characters. And that really got me thinking about it, even more than the fiction I’d read before that. In fact, Shakespeare goes back to high school, when we used to do a play, read a play and see the movie. I think he was my first influence in thinking about the depth of characters, what people perceive and what the character actually is, or how he sees him or herself. And I’ve always been fascinated by that because I think we all know what’s visible to other people and what we keep inside, and we’re always fascinated by what people don’t see and understand about us. LB: I love that. I love that. But before you wrote mysteries, you actually wrote about mysteries. FB: Yes, I started out, after I’d finished my dissertation, I was living in Frankfort, Kentucky, small town, lovely small town and I had a lot of time on my hands, just because it was a smaller town. And so I looked around for something I could write about. I didn’t want to try to transform my dissertation into a book right at that moment, I wanted to do something that would be fun. And I discovered no one had written a book about black characters in crime and detective fiction. And so I ended up writing Out Of The Woodpile. But in the process of doing that, I started going to writers conferences, first Mystery Writers of America and then later Sisters In Crime, and I joined both organizations and I was interviewing writers. And this brought me full circle back to the interest in writing I’d had since I was a teenager. And of course having done some research on mysteries, I thought why not write one? LB: Well, before we move on to your fiction, you also have written crime history. And it’s about your own, two places you have yourself lived, right? Danville, Virginia and Albany, NY. FB: Yes. Danville, Virginia is my hometown. In fact, Gallagher is the stand-in for Danville in my Lizzie Stuart fiction, she lives in Gallagher. And I add a bit to the town, like a major university and some other things. 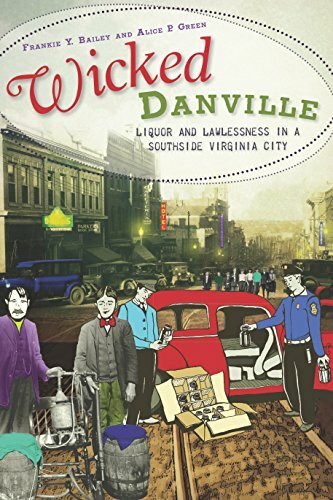 But, yes, I have a book about Danville that grew out of my dissertation. My dissertation for my PhD in criminal justice was actually about Danville in the early 20th century. And then when I moved back to Albany — I was a grad student here at Albany — I actually wrote a book about Albany during that same period, Prohibition and the Great Depression. Then I decided to go back and turn the Danville dissertation into a book. And I’m a crime historian, that’s one of my areas, I do crime history and mass media popular culture. So I also, with a coeditor, edit some encyclopedias about famous crimes, notorious crimes and so on. LB: Have you ever been surprised by any of the dirt you dug up? FB: Maybe in the beginning, not anymore! I hate to say this, but I am no longer surprised by anything that people might do. And that’s why going back and forth between real life crime and fiction is so fascinating. Because there are things that happen in real life that if you put them into a novel, people would say, that would never happen. LB: Well, that’s a perfect transition, because the heroine of your first series, Lizzie, is also a crime historian. FB: Yes, and I created her that way in the beginning, when I started out, because I wanted to use my real-life research in the books that I was going to write. And so in all of the books except the first book — she’s on vacation in England and so that doesn’t have the historical element, except for the location where she’s vacationing, Cornwall. But in the other books there’s a crime in the past and a crime in the present, and I tried to base the crime in the past or at least be inspired by real-life. And so she goes through the process of researching that crime in the past. LB: Is the series complete? FB: The series is not complete. I have five books in the series that have gone out of print right now, except for the last. I’m in the process, I don’t want to jinx myself by saying too much about this yet, but we have a contract that’s being hopefully signed off as I speak that’s going to bring the first five Lizzies back into digital and print on demand, and I’m working on the sixth book in the series. LB: Oh, that is such fantastic news! FB: I’m excited to be back to that series again, because I left her at a crucial point in her life. The series is set in 2004 at this point. It moved very slowly. I started writing it in 2000 in real time and because the series has moved very, very slowly, we are now in 2016 and only two years have passed in the series. I’m writing about nothing in the present. Hannah McCabe is in the near future, Lizzie is in the past and the other projects I have going are all set in the past as well. FB: I I think they’re the same reasons for committing crime. What’s changed in modern times, particularly in the 21st century, is that some crimes are committed in new ways. So now you can harass someone on the Internet, in the near future there’s this idea that you might even be able to commit murder long-distance by hacking into someone’s, you know, if someone’s in the hospital, for example, that you might be able to hack into a system or something. We’ve seen this already on television shows. So that idea that now things that were once done close up and personal, embezzlement, robbery, other things, bank robbery — can now be carried out at a distance. You can have people in another country who are engaging and would be crimes in the US. 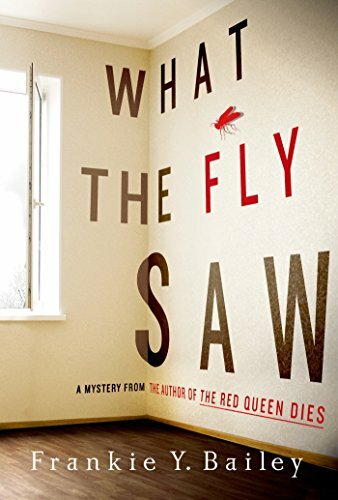 Having other people under surveillance, placing devices on their cars or on their phones, devices that are not easy to detect by the person who’s being followed or under surveillance — which idea would have been in the Hannah McCabe series. But the motivation, the reasons for committing crimes, still there. Most crimes are still personal, upfront, face-to-face crimes, but in the near future there more and more crimes that are going to use the technology. LB: Well, let’s talk about Hannah McCabe for a bit. That’s set in the near future, which we’re actually approaching. FB: Yes, it’s only set in the near future because — well, there are a couple of reasons. I live in Albany, New York, and I’m writing about Albany and I wanted to use Albany history, real-life history. But I wanted to make it clear that my Albany is not the Albany of real life, because for example, as I was writing my book — there are two books in the series, but the first one particularly, The Red Queen Dies, there was an election going on for, about to come up, for mayor of Albany. And Albany had never, up to that point, had a female mayor. And so I decided to have a female mayor in my book. And then a wonderful, well-qualified woman was elected mayor. And so I now have this mayor in my book and I’m not going to change that, because the character is a character I am really finding interesting. But being in the near future and having somewhat of a parallel universe means that I have deniability. I can say this is not, and it is not, the Albany police force. This is not the mayor in real life. This is my fictional version of what’s going on. LB: Do you feel that gives you some extra freedom? FB: It does. One of the other reasons I wanted to do the near future — and the future is catching up with us and moving much more quickly. Near-future writers talk about that, how quickly the future can catch up with you. But I wanted to deal with issues like surveillance and climate change and immigration and all the things where we’re at the tipping point right now, or when I started writing about this in 2013. Those things are happening in my near future, and virtual reality is a reality and that’s having an impact. And all kinds of things that are, the devices — one of the things about Albany in real life is that Albany is a very old city and so our infrastructure is not really set up for something like the kind of surveillance systems that I have my book, though we do have surveillance almost everywhere in the city now in real life. But I wanted to look at, for example, what would happen when a surveillance system that police depend on when it’s relatively fragile in the sense that weather conditions, solar flares, other things that are going to be disrupting surveillance systems in the future is something that my characters are dealing with now in terms of having the surveillance system knocked out, for example. Because you have to plan, how do you commit a murder, have your character commit a murder when surveillance is everywhere? So what happens to make that impossible for the police to view on their screen and see you coming and going? So I introduce climate change and other things that are throwing things off in terms of what people expect to happen. FB: How am I going to get myself out of that? (Laughter) Because there’s the overarching murder in each book and as you mentioned there’s the character arc and the series arc with things happening to people and things they don’t know about and other things. And so in the next book, I want to deal with that for those people who have been reading I want to know it’s going to happen and how that can be, at least with that series arc, wrapped up in terms of what’s going to happen. But, yes, when I started to write it, I was reading and doing research and the book starts out as a presidential election’s approaching and so there are all of those issues and the personal issues that Hannah herself comes to the series with in the sense that she — I’m not giving anything away because it comes up early on in The Red Queen Dies, that when she’s nine years old, she kills a man who is breaking into the family’s home. And so thereafter she’s dealing with the impact of that on her older brother and her family and eventually she becomes a police officer. So she has something in her past that makes her more thoughtful and more compassionate. Not to say that police officers are not. I did some research in real life, riding along with police officers years ago when a colleague and I were doing research on stress and policing. And I did some ride alongs with female police officers and their partners, so I’ve had a chance for some years to think about that. I’ve always wanted to do a female police officer. But she is also biracial, her late mother was African-American, her father is White and he’s a former journalist and she grew up in a very liberal home and so she’s always trying to balance who she is and her background and what she’s seeing out in the streets and how she’s dealing with people. And she has a young partner who she hasn’t quite made up her mind about yet. So, many things going on there. And there are things going on in the police department in Albany, and out there in the larger world. LB: Yes, layers and layers and layers. Well, the great pleasure of that of course is for the reader who reads the series in order, everything echoes and everything pays off. FB: Yes. 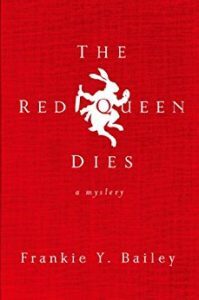 The goal is to make each book a standalone so that anyone can pick it up and not have to go back and read The Red Queen Dies before they can read What The Fly Saw. But, just because of the nature, when you try to make characters to the best of your ability real people, their lives go on and things just don’t end because this case ends. Hannah’s life still continues. And the same thing with Lizzie, you know. That’s why when I was saying I left Lizzie at a crucial moment in her life, that’s why I’ve been eager to get back to her and try to bring her forward a bit. So when you’re dealing with a couple characters, and the third character that I’m thinking about working on now, you’re moving back and forth and trying to keep them all moving forward. LB: Well, let’s talk about that third character now. You’re working on an historical set in 1939. FB: Yes, but the third character is not in that historical, she’s in another — she’s in 1948, in a village in upstate New York. And I’ve written a short story about her and I’m waiting to see how that’s going to, if someone’s going to buy that. And I’m also thinking about a novel for her. But the 1939 book comes out of my historical research. I love 1939 because so many things were happening there. It’s towards the end of the Great Depression because the war is about to begin, but then in April of 1939, Marian Anderson performs at the Lincoln Memorial. The New York World’s Fair is going on that summer. In the fall, Billie Holiday’s — even before, she ends her performance in August — but she’s performing at the Café Society and she’s performing Strange Fruit. And then in December of 1939 is the premiere of Gone With The Wind in Atlanta. That’s a four-day premiere. And I thought, you know, there are so many interesting things going on; the World’s Fair is the World of Tomorrow and then you have Gone With The Wind and it’s about the past and you’ve got all of this technology and the old and the new all coming together in that year. And so I wanted to write a book that goes from April to December. I’m calling it a thriller but it’s going to move a bit slower than most thrillers because I do have that force to abide by, when these things are happening. And so I’m moving the characters along but I want those things to be happening as they’re moving through the book. LB: Wow, that’s fantastic. I love how you challenge yourself with every series. Nothing is — you’re not writing the same book again. FB: Yes, the 1939 book is really scary for me because I’ve never written a period historical. Because with Lizzie, I have historical elements, that she reads the documents and does other things, and with the new character, Jo Radcliffe, I’ve written a short story about her but I’ve never sat down to write a complete historical novel. And so just the challenge of trying to get everything right — because people who read historical novels like to know that you did your best to get most of it right. And at the same time, introducing fictional characters when there are real characters like Eleanor Roosevelt, for example, who could do a cameo or have a walk on. That’s just fascinating to me. You could spend years researching one historical novel because there are so many ways you could go off and get involved and looking at other things… So I’ve just got to set a limit to how much research I can do. LB: I can’t let you go without learning some more from your research. You are an expert in African-American mystery writers. FB: Well, yes, I’ve done some research, but there are always new writers coming along. LB: Well, who are some of the most exciting voices you encountered when you are researching your book? FB: Well, I don’t want to talk too much about present writers because I’ll forget someone and I’ll be in trouble, but Walter Mosley is always fascinating to me. In part because of his historical novels. He starts out with Devil in a Blue Dress and he’s writing in the past, after World War II, and he’s bringing that series up through the 50s and the 60s and going on. There were earlier writers like Pauline Hopkins, the first African-American woman to, at the turn of the 20th century, publish short stories and a novella in serialized form. And so you have people who have been forgotten that I tried to go back — Rudolph Fisher, he has in recent decades been rediscovered, but he was a physician in Harlem during the Harlem Renaissance and wrote The Conjure Man Dies, and for decades people didn’t know that much about him. They had sort of forgotten him, and then he was rediscovered and so he’s really fascinating. So a lot of writers who were the first to do something or did something particularly well. And Eleanor Taylor Bland, of course, the late Eleanor Taylor Bland who was the first African-American woman to publish police procedurals. And died too early, but Sisters in Crime has an award in her name, a fellowship in her name. And she’s just fascinating to me. LB: I want you to put on your criminal justice hat for just a second. LB: I had the pleasure of interviewing another writer, Maggie King, and the conversation turned to justice. And not just that characters want justice, but that mystery readers, that’s one of the things that draws us to the mystery genre is this desire for justice. FB: Well, I think it depends on the reader and what that person is reading, or chooses to read more of. I think that if you’re reading a book — because there are sub genres within the crime fiction genre. So if you’re reading a cozy or a traditional classic mystery — I don’t write cozies I write classic mysteries, whodunit. Even with police procedurals, I have that element — where people do hope for closure, do expect closure. They want to know at the end that justice has been done, the murderer has been apprehended or is about to be or something. They don’t want to go through the whole book and find out at the end, and have the murderer walk away. Where, if you’re writing a thriller, you expect to have this killer return, serial killer for example. The reader might know going into it that this is a thriller, might think, well it’s possible something will happen at the end but the killer might get away and he might return another day to torment this, the police officer. But I think even then, you expect to have some type of closure, you expected at least someone will be apprehended and brought to justice. That something will happen, someone will be identified. So, yes, I think that’s the difference between thrillers and classic detective stories and cozies, just in terms of what the reader expects going in. But I think most people who read crime fiction do have a great concern about crime and justice. People who read crime fiction are invested in both characters and plots, as well as setting. And so with that investment, with three-dimensional characters, they do like characters to have, even the villain to have a back story, and that villain in some way at the end get his just deserts, whatever those are. LB: I love the idea that the villain is to have a back story and be three-dimensional. I think that’s something that’s absolutely critical for a great mystery. FB: Yes, I love those kinds of books. I like books that move quickly, I enjoy some thrillers that move really fast now and then. But I like to be invested in characters, whether they’re good or bad or, like most of us, some combination of good and bad. Because the villain, as has been often said, thinks of himself or herself as the hero. So when you’re looking at the villain’s back story, as I’m trying to do in my 1939 book where I have someone who’s doing something, planning something really bad, but this person thinks there is a really good motive for doing this. LB: So, what’s next for you? FB: Well, I’m working on the Lizzie Stuart book, and, very slowly, on Hannah McCabe, and even more slowly on the 1939 book. I usually have multiple projects going. But I’m also trying to finish up a nonfiction book about dress, clothing, appearance and criminal justice. It starts in the colonial period and works forward, so I’ve been working on that for some time and hoping to get that draft done quickly in the next few months, because it’s about time to wrap that up. And so I think that’s about as much as I can handle at this point. FB: At Type M For Murder. LB: And then you also have your website. FB: Yes, that’s FrankieYBailey.com, and if people drop me a note, I try to get right back to them as quickly as I can. LB: Oh, that’s fantastic. I must say, I do love the Internet because it allows us to connect to people we admire. FB: Yes. I’m also on Twitter, by the way. Just @FrankieYBailey. LB: Terrific. And I’m going to link to both of those sites in the show notes. Frankie, thank you so much for joining me today. FB: Thank you, Laura, for having me. I enjoyed really so much chatting with you.